Yoga is an excellent practice for people of all ages and abilities to enhance physical and mental health and for overall well-being. Outcall (Mobile) Massage in the comfort of your home or place of stay. Customized massages to increase relaxation and decrease muscle tension. Click here for massage rates and more info. Moderate 60 minute outdoor yoga. The Mission of Oceanfront Yoga is to provide you with an authentic yoga experience in a spectacular setting to prepare you for your day of adventure, work or play. Public outdoor classes for all ages and abilities to improve overall well being. click on the yoga class page under the menu bar for more detailed information. 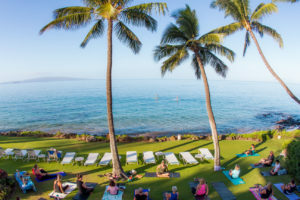 Join one of our Maui oceanfront Yoga classes! First come, first served basis, show up at Kamaole Nalu, 2450 South Kihei Road, meet at shoreline. Every Sunday, Tuesday and Thursday at 8:00 am. Go to the menu bar and click the yoga class page for more detailed information.